Amazon River Cruises Review: Places, Boats and Prices! The Amazon is such an incredibly massive destination, it can be overwhelming determining where and how to plot your adventure. Amazon River cruises can be a great beginning when visiting one of the many South American countries that the Amazon River races through. You can select Brazil cruises or to depart from Argentina, Bolivia, Ecuador or Peru. In case you are wondering, Aqua Expeditions offers the most comprehensive Amazon River cruises with a touch of elegance, style and luxury. They offer sailings of 3, 4 or 7 night itineraries. Prices range from $2,600 for 3 nights, $3,600 for 4 nights and the 7 night all inclusive trip is $6,300. You will begin your expedition into the Amazon leaving Peru with Aqua Expeditions on the M/V Aqua or M/V Aria. After departing Iquitos there will be scheduled stops along the Amazon River for excursions such as river exploring, fishing, a monkey and dolphin expedition and a jungle walk. More stops will be made at the Puerto Miguel Village and the Pacaya Samiria Reserve as well as a night trip through the Pacaya River. Aqua Expedition has a fleet of small luxurious vessels and can typically accommodate 24 guests plus staff, giving you an intimate encounter on Amazon River cruises. There are 12 oversized suites, including 4 master suites, featuring outward facing panoramic views of the river and wildlife. The ships themselves boast fine linen, private baths, lavish toiletries, centralized A/C, crystal and china dinner service and accommodations comparable to a 5 star hotel as reasons to select them in your travel planning. On Aqua Expeditions’ Amazon cruises, guests will also enjoy classically prepared Peruvian cuisine on board. The menus have been created by some of the top chefs in Peru. The culinary feasts will tempt your senses and have you longing for more, well after your cruise is over. 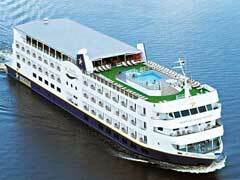 In contrast, Amazon Voyages offers a different approach in their Amazon River cruises. Their objective is to set sail on educational expeditions, teaching the cruisers along the way. This lessons start off aboard restored historical steamboats from the early 1900’s embarking from Peru. The vintage vessels are equipped to accommodate 10 to 18 passengers and take you back to a simpler life and time, as cabins are only furnished with a bed, desk, wardrobe and a private bath with shower. Large dining halls serve dual purpose for both meals and lectures. Cruisers are educated by visits to Nauta Cano, forest trekking with scientists, bird-watching and wildlife observations. During your river cruise, you will learn many Amazon River facts that will enhance your experience, enrich you and expose why it is so important to assist in the conservation of the river. Daily field activities are also part of the experience. Several stops will be made for Amazon River tours to search for dolphins, fishing excursions and visit some of the indigenous villages along the lowlands. This 7 day learning vacation is priced at $2,600/person. The Amazon River is home and a source of life to countless indigenous plants, wildlife and insects. The history, culture, wildlife and natural beauty surrounding the Amazon River make it an eco tourism paradise.